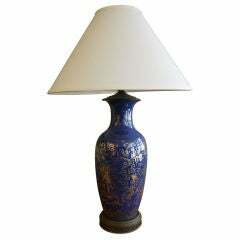 A Chinese 19th century cobalt blue roleau shaped vase mounted as a lamp. Vase itself is 9 inches wide. A 19th century cobalt blue vase with gilt design and reserves with white ground and landscape and figure design. A pair of early 20th century famille noire vases with reserves of floral design. Decorated overall with greens and blues, baluster form with handles. This handmade vase was made in the 1920s in a glazed cobalt blue ceramic with decorative raised shapes around the base of the neck. The item is thin and hollow. Antique bronze-mounted Chinese famille rose mandarin pattern vase custom mounted as a lamp with new, custom silk shade trimmed in dark blue ribbon.